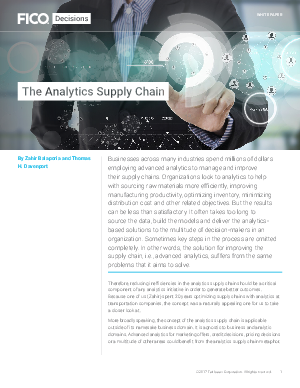 The role of analytics in managing, improving and ultimately transforming supply chains cannot be understated. But what about the analytics themselves? FICO’s Zahir Balaporia and renowned author Tom Davenport use the term “The Analytics Supply Chain” to reflect that the actual analytics themselves parallel supply chains, with inherent challenges and problems if things “get stuck.” Rethinking analytics in these terms can not only improve supply chain performance, but also any other business problems you seek to solve. · Key questions to ask yourself in determining where you need to fix your analytics supply chain.